Do you have a big idea for how to make an impact? 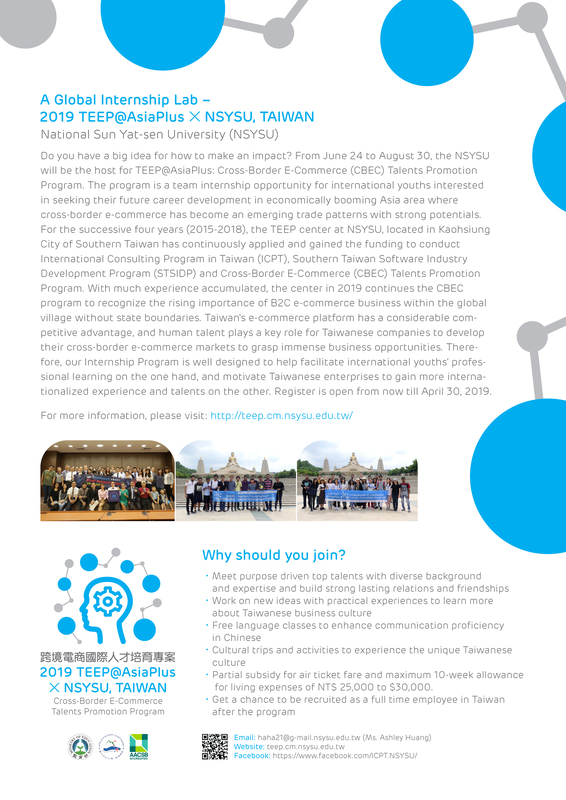 From June 24 to August 30, the NSYSU will be the host for TEEP@AsiaPlus: Cross-Border E-Commerce (CBEC) Talents Promotion Program. The program is a team internship opportunity for international youths interested in seeking their future career development in economically booming Asia area where cross-border e-commerce has become an emerging trade patterns with strong potentials. For the successive four years (2015-2018), the TEEP center at NSYSU, located in Kaohsiung City of Southern Taiwan has continuously applied and gained the funding to conduct International Consulting Program in Taiwan (ICPT), Southern Taiwan Software Industry Development Program (STSIDP) and Cross-Border E-Commerce (CBEC) Talents Promotion Program. With much experience accumulated, the centre in 2019 continues the CBEC program to recognize the rising importance of B2C e-commerce business within the global village without state boundaries. Taiwan’s e-commerce platform has a considerable competitive advantage, and human talent plays a key role for Taiwanese companies to develop their cross-border e-commerce markets to grasp immense business opportunities. Therefore, our Internship Program is well designed to help facilitate international youths’ professional learning on the one hand, and motivate Taiwanese enterprises to gain more internationalized experience and talents on the other. Registration is open from now till April 30, 2019. Partial subsidy for air ticket fare and maximum 10-week allowance for living expenses of NT$ 25,000 to $30,000. We welcome all international youth talents who are interested in seeking their careers in Taiwan to apply. As for the academic degree consideration, applicants with MBA degrees are on the first priority, followed by other master’s degrees, BBA degrees, and other undergraduate degrees. Nonetheless, applicants’ status can be upgraded upon receiving appropriate information and documents to demonstrate and justify their qualifications. Skype interviews might be requested to Non-native English speaker applicants. All in all, this is quite an amazing summer internship opportunity in consulting project for international youths all over the world, providing a once-in-a-life-time experience working with international talents, local Taiwanese companies, and senior consultants at the same time. For more information and application link, please visit this site.